It is a spiritual path that shares themes with Christianity, Eastern Mysticism, and modern psychology. Its central teaching is forgiveness. It is a mind training course designed to help you remove blocks to Love and remember Oneness. The Text - written in book form with chapters and paragraphs. The Workbook - a set of 365 daily lessons covering a year. The Manual for Teachers – written by topic with a Clarification of Terms. The Course says we are all teachers and students. The Song of Prayer – prayer, forgiveness and how to commune with God. Psychotherapy: Purpose, Process and Practice – the process of psychological healing through mutual forgiveness. What can you Expect as Outcomes? However, it is the exceptional person who learns alone, and indeed, A Course in Miracles says we ultimately must experience this work with others. Study Groups allow interaction, exchanges of viewpoints, sharing of personal revelations and awarenesses. Who should attend a Study Group? Any seeker - ones with experience with A Course in Miracles or those who have never worked with it previously. Just bring your Course (or borrow one of ours) and a receptive mind. How is a session conducted? Facilitator, John Vyvyan (see About ), picks a theme in ACIM. He selects passages from various parts of the Course and may add from other authors to clarify and illuminate the theme. Discussion is lively and understanding abounds. Study Groups are not a practice of psychiatry, psychology, or counseling in the traditional sense. 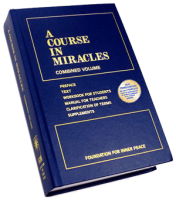 Through discussions of A Course in Miracles members apply the ideas and principles in a self-study. The learning time is optional; the curriculum is not.